Sign up to get the latest updates on Age Friendly Edmonton and upcoming seniors events delivered right to your inbox. Learn about what difference we are making in the lives of seniors and in our community. 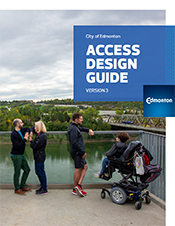 Learn about what Age Friendly Edmonton has accomplished so far. We are looking for your ideas on the specific actions we can take to advance the age friendly initiative in your communities and across the city. 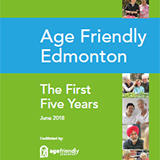 This report to the community contains the stories of Age Friendly Edmonton, the first five years. It tells the stories of regular Edmontonians who have chosen to work together to build a city that’s happier, safer, friendlier, warmer, and more interesting, for everyone of every age. Age Friendly is an international movement in which cities and communities around the world are preparing for two major demographic trends: aging of populations and urbanization. One million people worldwide turn 60 every month and United Nation estimates the number of persons aged 60+ will double from 600 million to 1.2 billion by 2025 and again, to 2 billion by 2050. Many of these older adults will continue to live in their homes and communities, but these environments have not always been designed to meet their needs. In 2010, the City of Edmonton became a member of the World Health Organization (WHO) Global Network of Age Friendly Cities and Communities. This network includes 454 Cities and Communities in 37 countries, along with 11 affiliated programmes. Creating an age-friendly city is one of the most effective policy approaches for responding to demographic aging. As a member of this global network, Age Friendly Edmonton has access to resources, tools, expertise, and best practices from across the world. 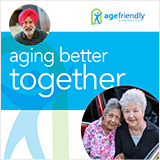 In 2010, City Council adopted the Edmonton Seniors Declaration and Edmonton Seniors Coordinating Council led extensive consultation and development of an action plan based on the World Health Organization’s Guide age-friendly cities. In 2012, the Vision for an Age Friendly Edmonton Action Plan was endorsed by City Council and ongoing municipal funding was approved. Since 2013, Age Friendly Edmonton partners have been actively implementing projects and initiatives that will help us achieve the goals outlined in the Vision for an Age Friendly Edmonton Action Plan. Request a presentation from the Healthy Aging Information Series.